A user with Administrator rights can assign access to different parts of the system for different users. Go to Admin >>> Co-workers and click the Search button on the right. Select the user you want to change the access level for and click View details. When you have found the user, navigate to the second tab called User groups. Tick off the check boxes for the User groups that you want that specific user to be a member of. Each active user should always have the "Home" box checked off as this is necessary for the user to access all the other groups. Whenever you change the User groups for a user, that user must log out and log back in for the assigned User groups to come into effect. 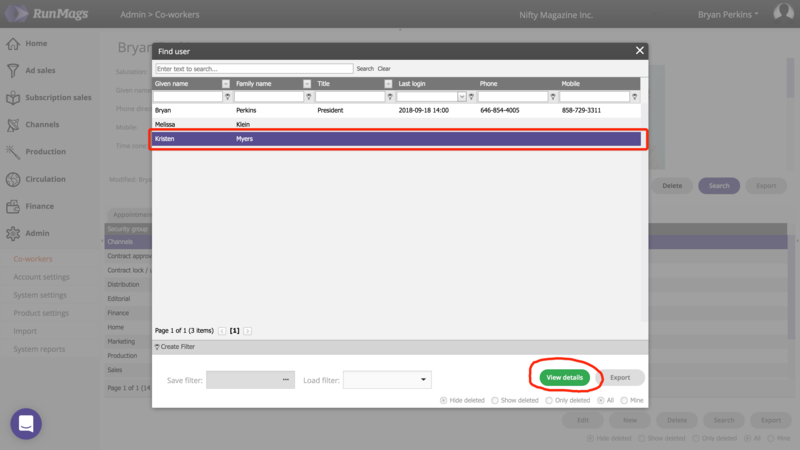 The example above is showing how a sales rep is provided access to manage ad sales. On the right hand side you can scroll up and down within the list of access levels.